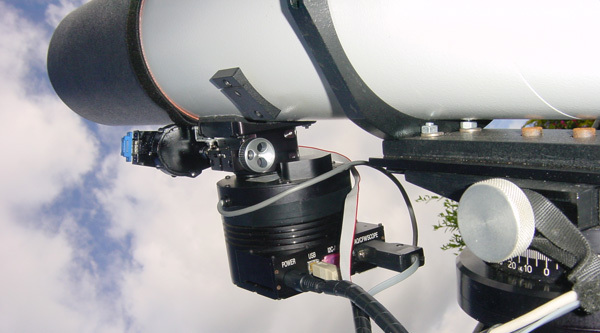 TSO is a small observatory setup for digital astrophotography and video but is also used for recreational observational astronomy. It *was* all recreational until recently. and covers the equipment installed in it. Images and Video from TSO have been published in national and international publications and also used for various television broadcasts. Previous equipment installations used for taking various images on the TSO webpages can be seen by using the button on the leftside button bar. The main scope is a Russian-made Intes MN-61 Maksutov-Newtonian (MNT) with a 6-inch primary mirror and a focal length of 900mm. Collimation is critical and was simplified by use of a Kendrick SCT Laser Collimator. When collimated, the Intes performs brilliantly. With a secondary obstruction of less than 20% contributing minimal contrast loss, this scope performs much like a premium 6-inch Apo refractor costing ten times as much. Focus and collimation are also very well retained. A cooling fan has been added to the rear-cell. 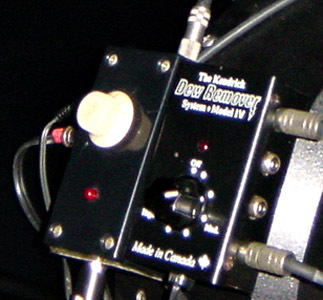 Powered by the Skywalker II highdrive outputs enabling it to be software controllable. 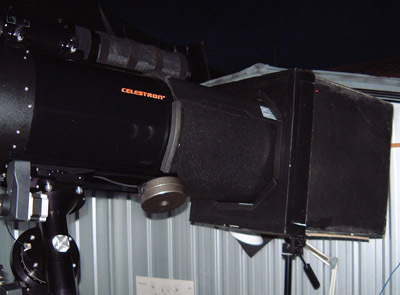 The main mount is a Losmandy G11 (see makers section) with a carrying capacity of 60lbs (28kg). 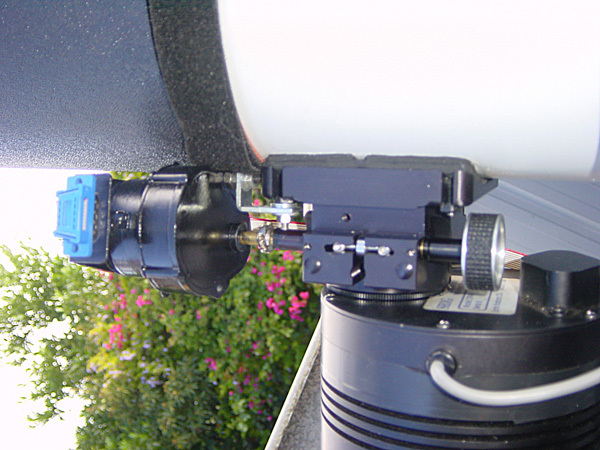 The mount is controlled by the Astrometrics Sky Walker II telescope control system. The SWII is a very robust and well supported system. The ST-10 power supply is strapped halfway up one of the tripod legs with velcro straps to try and extend the reach of the power cable to the camera. The Sky Walker hand controller, with the 4 red buttons provides limited controls, but the fully-featured Skyguide software running on the main PC provides complete Goto control, hand-paddle functionality and system feedback. Average weight on the mount is approximately 25kgs. The imaging train consists of an SBIG ST10xe CCD camera and CFW8 filter wheel (see makers section). This setup produces a field 56 x 38 arcminutes on the ST10xe. This is very nice achromat optically and shows a classic airy disk and diffraction pattern at focus. Being an achromat it does display an unobjectionable purply-blue halo at high power which is somewhat alleviated by a William Optics Minus-Violet Filter. The 102mm is held onto the MN61 rings by a Losmandy Secondary Rail with 5" Losmandy rings. This is the primary guide scope and is at a slightly longer focal length than main imaging scope which gives very good tracking without worrying about the ST10 guide chip not finding a guide star through filters. 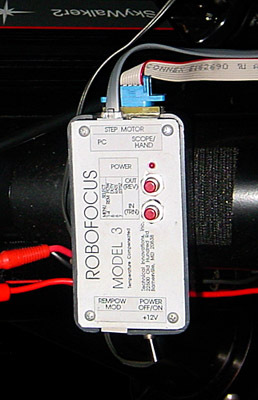 Computerised focusing is enabled by a Robofocus Controller (right) and Robofocus stepper motor (left) mounted directly to a JMI NGF-DX2 crayford focuser. The controller is connected to the main computer's serial port and focus can be done remotely. Focusmax (see software section) works brilliantly with this system, consistently converging on perfect focus within a couple of minutes. The 102mm f5 also has a Robofocus motor on it, but the current Robofocus controller and firmware does not allow control of more than one motor. The Kendrick Dew Remover system keeps the exposed glass dry on all three scopes. The complete system consists of, a heater element for each of the MN61 corrector, 102mm objective and finder objective, a dew shield for the MN61 and a System IV controller (right). The controller is mounted on the side of the G11 mount. It can handle 4 heaters at a time and splitters are available to double that. Collimating the MN-61 was a bit of a pain until I decided to try and use the Kendrick SCT Laser Collimator that I could never get to work properly on my SCT. It did work perfectly with the MNT though. 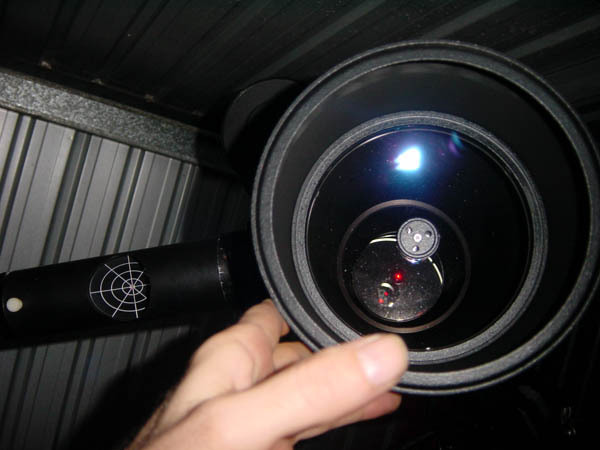 This picture shows the secondary collimation which was easy enough, only requiring the laser point to be centered on the spot in the middle of the primary mirror. Collimating the primary was also easy with the SCT collimator, but it needs to be dark. Turning off the lights enables you to see the ring reflection from the primary on the SCT collimators grid. Centering the ring on the grid by adjusting the primary collimation bolts gave an almost perfect primary collimation. The 12" Lightbox was made from the instructions in the book Astronomical Image Processing, by Richard Berry and Jim Burnell (see the software links). 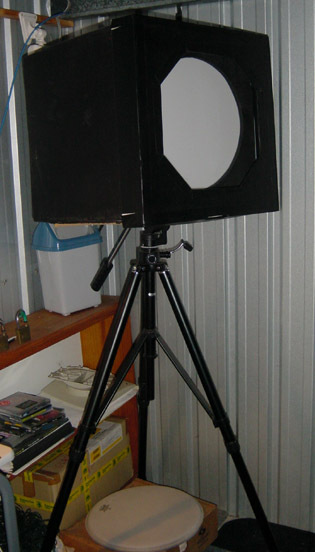 Aligning the lightbox with the scope is simplified by mounting it on a camera tripod. This gives enough flexibility to easily and accurately align the telescope with the lightbox for taking flatfield images to be used when calibrating the raw images. One of the Red LEDs is visible at the top-left of the lightbox. There is a red LED positioned next to each bulb so they can easily be checked. All four bulbs need to be working for correct flat fields to be obtained. Ok it's a table in the corner rather than a center. More of a trolley. 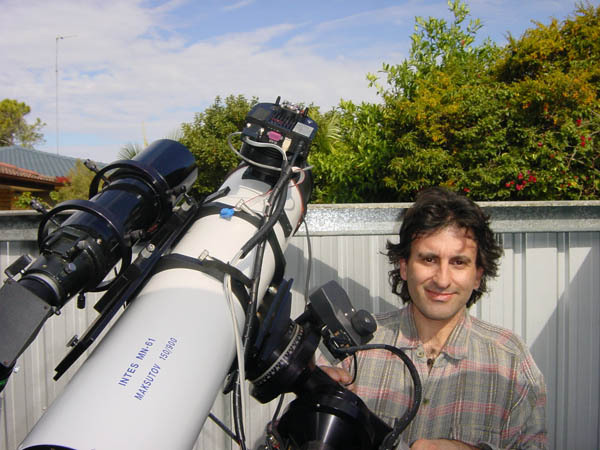 With a Pentium 1Ghz PC that controls telescope tracking, pointing and imaging systems and connects the observatory to the house (and the world). 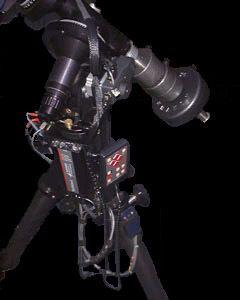 This computer controls telescope focus, pointing, camera control, guiding and image capture. A 12vdc 11-amp regulated power supply is beneath the G11 tripod and provides 12vdc to the entire scope and powers; the finder reticle, guidescope reticle, Kendrick Dew System, Sky Walker II and motors. The power and signal cables run to the telescope via the reinforced cabling channel on the floor beneath the computer. The observatory computer is connected to a 100Megabit TCP/IP network. 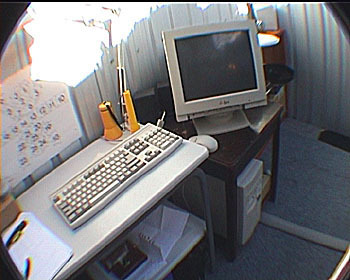 Files can be transferred from the observatory to the main computer at any time and the telescope and cameras are controlled remotely with the WinVNC remote control software (free from AT&T). The observatory is connected to the world via an internet gateway on the host machine inside the house. The observatory computer is synchronised with the U.S. Naval Observatory online Nuclear Clock before every use. The wiring to the telescope for power, computer interface, focuser, guider and cameras runs from the control centre within a 4-channel cable housing shown above-left with the cover off, and emerge beneath the G-11 tripod legs. Underneath the mat, on the old pier slab they are loomed together and come up at the bottom of the G11 pier where they go their own way. 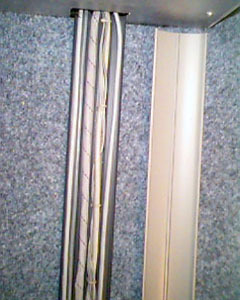 Power and signal cables are grouped seperately to prevent interference. 12 vdc from the 11amp power supply runs to the scope and connects to a custom-made power box that has six RCA connectors. These can be used for powering any 12vdc device at the mount. It has two power input channels to allow two different power supplies to be used if needed. The single cable shown at top, runs 12vdc from the mount to the scope. 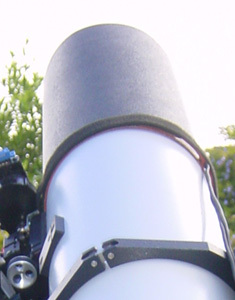 Main Scope Intes MN61 150mm @ 900mm (f6) Maksutov-Newtonian Telescope. Losmandy G11 28kg carrying capacity. 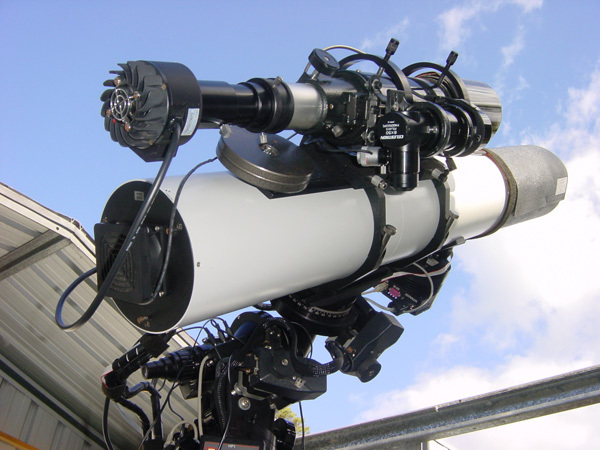 Telescope Control Astrometric Instruments Sky Walker II. Main Camera SBIG ST10xe 2184x1472x6.8um Kaf-3200e CCD. SBIG ST-5C (Pixcel 255) 320x200x10um TI-TC255 CCD. SBIG Dichroic Filter Set w/IR rejection. 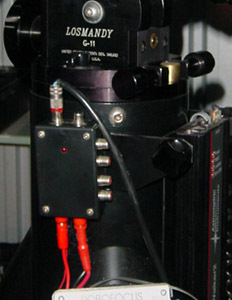 JMI G11 Illuminated polar alignment scope. Maxim DL CCD Camera Control Software. AtomTime Synchronises the PC clock with an online atomic clock.